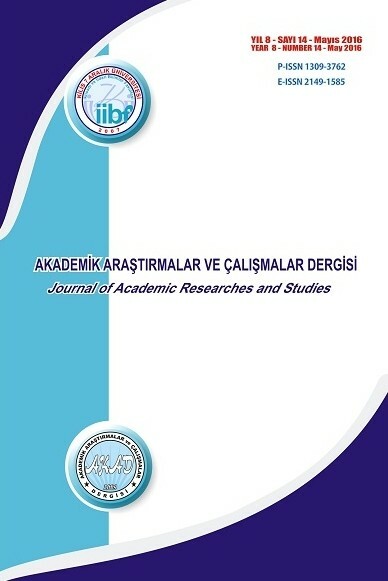 Our Journal, a scientific peer reviewed one, has been published by the Faculty of conomics and Administrative Sciences at Kilis 7 Aralik University at least twice in a year, May and November since 2009. Applied, institutional, theoretical works along with analysis and definitive, qualitative and quantitative researches in relation to Economics, Business, Law and Management disciplines could take places in the journal. Indexing: Our Journal is indexed by TUBİTAK-ULAKBİM TR Dizin Social and Humanities Sciences Database, IndexCopernicus, Cabell's International, International Scientific Indexing (ISI), CiteFactor, BASE, Advanced Science Index, JIFACTOR, DAIJ, OAJI, Scientific Indexing Services (SIS), Research Bible, InfoBase Index, Electronik Journals Library, ESJI, Google Scholar, Türk Eğitim İndeksi (TEI), ASOS, Akademik Dizin, Araştırmax, Acarindex. KAR ORANLARI KONJONKTÜR YÖNLÜ MÜDÜR?